Family Business United is delighted to champion the family business sector and announce a new campaign that celebrates great family business ambassadors each week. Family Business of the Week, shortened to the hashtag #FBOTW on Twitter, is a social media campaign that has been created by Paul Andrews in order to champion the sector and continue to raise the bar for family businesses and all that they do. Each week, family businesses are being encouraged to tweet Paul @FamilyBizPaul and describe themselves in one tweet including the all-important hashtag #FBOTW. Alternatively, they can send in their news stories and achievements to news@familybusinessunited.co.uk and items posted will be added to the mix of potential winners. Every Friday afternoon at 3pm, entries are reviewed and the winners are then re-tweeted. As Paul Andrews, Founder and Managing Director of FBU explains, "We are constantly seeking ways to give recognition to the family business sector and this simple initiative will do just that. We want to recognise the contribution made by family firms of all shapes and sizes and will select the winners based on what they have done, something that deserves to be celebrated, and help us in our cause to champion family firms for all that they do." 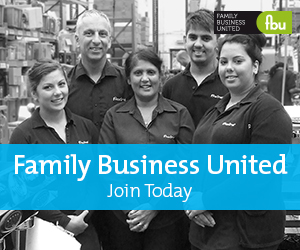 Each week, the team at FBU will identify family firms that have achieved something special and award them the title of Family Business of the Week. A social media driven campaign, this will help to draw attention to the contribution that family firms make to the global economy and celebrate their achievements too. Winners will also be invited to complete a free profile on www.familybusinessunited.com and to share their stories too. Keep up to date with the campaign and all the winners here too.